Knowledge about the American social environment in the transitional period following the Civil War is still incomplete in certain respects. Robert Moton, a respected black educator and a tireless promoter of racial harmony, has left us a memoir that provides a unique and valuable perspective on the progress in civil rights from the 1860s to the 1920s. Finding a Way Out describes the critical changes in American culture that gave blacks the opportunity to attain a social rank never before envisioned. Moreover, this work is a detailed record of a great "success story". Despite being born to former slaves, he was able to secure the assistance of many kind and generous benefactors. He recounts his own spectacular rise from extreme poverty, to a highly admired position of authority, giving us an "inside look" as to how such a transformation is possible. This chronicle of Moton's life is interesting and instructive, and is especially inspirational for young people, showing them the value of education, discipline, hard work, and cooperation. 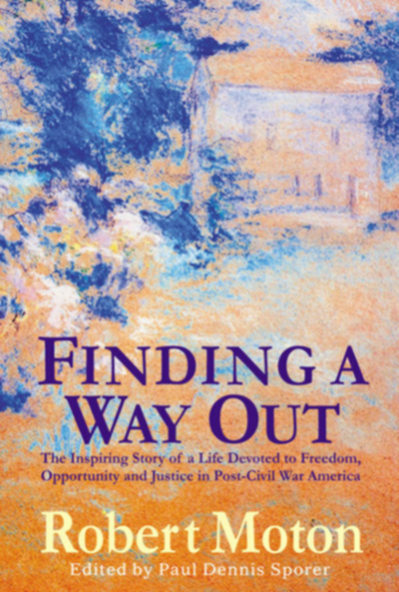 Finding a Way Out provides much information about the methods blacks used to obtain schooling and jobs in an American society that promised freedom and opportunity, but that in reality still had many restraints and restrictions. On a more personal level, Finding a Way Out documents the manner in which a young black man, armed with little more than determination and confidence, could reach one of the highest rungs of the success ladder in the United States, despite the odds. Read an excerpt from Finding a Way Out.